Spain are considered the leading nation in world futsal alongside Brazil. While the South Americans are revered for their technical prowess, their main rival is admired for their tactical organisation. They have won many titles in recent years but one of their most impressive performances was at UEFA Futsal Euro 2016 where they showed a dominance not seen for a long time at a major championships. 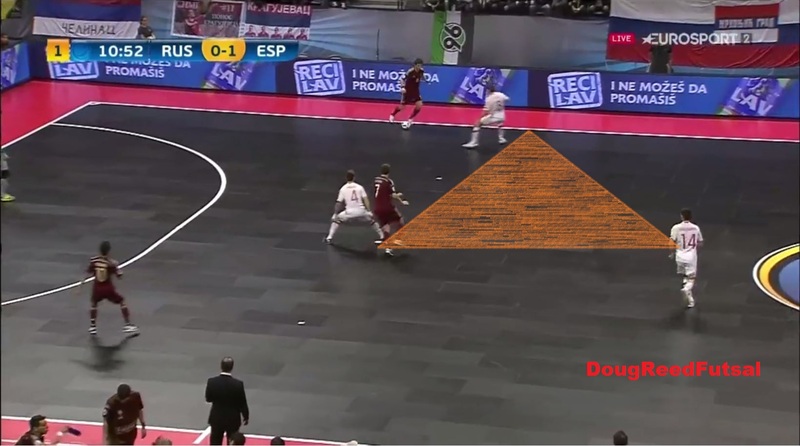 Futsal is often associated with attacking flair but in that tournament it was Spain’s defence that provided their most dangerous attacking threat. Led by conscientious Head Coach Venancio Lopez, the have a defensive system that is executed with impressive co-ordination, organisation and discipline. I will give an overview on the system they use when possession has been lost and they have had time to organise and be in position. This is seperate from how a team defends during transitions or set plays and known as positional defence. It depends on the competiton but around a third of goals are conceded during this phase of play. A defensive system is a collection of principles, concepts and guidelines that define how a team positions itself and co-ordinates its actions when out of possession. Different systems place a different emphasis on the location of the opponents and the ball when determining where players should position themselves. The relative importance given to each of these, the opponents and the ball, determines whether the system is more man-to-man or zonally orientated (from here the term individual to represent man-to-man will be used). Depending on the relative balance between these, any defensive system could be placed on a continuum from a pure individual defence to a pure zonal defence. In the former each defender is positioned according to the opponent they have responsibility for marking. In the latter each defender has responsibility for an area of the court depending on where the ball is. In practice no one applies a defence that would be placed right at the extremes as a combination gives better results. Any individual system will consider covering space to some extent. For example, generally the players will not mark an attacker that is far behind the play and will try to position themselves to help their teammates. In any zonal defence defenders will adjust to the movements of their opponents around their zone. Where this balance lies in each defence depends on the preference of the coach, the characteristics of his team and those of the opponents among other factors. We see that Italy use more individual marking and Kazakhstan apply a more zonal organisation, with both having success. Each type of defence has its advantages and trade-offs. An individual defence is easier to apply as each defender’s reference is only the direct opponent. It doesn’t require as much co-ordination, awareness or reading of the game. However, an individual defence leaves little cover or help, requiring each player to win their personal 1v1 battle. The 4-0 attacking formation is most effective against this system as it tries to provoke the defence into mirroring its positions before taking advantage of the space in-behind. A zonal system on the other hand provides lots of cover and tries to create numerical superiority around the ball. It gives the defence the advantage of numbers, especially useful if the players have less quality individually. Having cover reduces the risk that comes with being beaten, allowing the defence to be more aggressive in trying to win possession. The difficulty comes in its execution. Its strength originating from the collective co-ordination rather than an ability to succeed in 1v1 contests. Zonal defences are usually used to press with high intensity from half court or higher as marking space over opponents near the goal is dangerous. They are only used deeper in special situations such as defending the fly goalkeeper or when a defender has been sent off. Then the aim is to reduce the space to defend to make it easier to deal with the attackers’ numerical advantage. The Spanish defensive system applied by Venancio Lopez would be somewhere in the middle of the continuum mentioned earlier. It maintains the individual responsibilities for opponents of an individual defence but allows these to be exchanged between teammates in certain situations and features some of the principles of covering space from zonal systems. For this reason it is known as the Individual Defence with Exchanges or, more simply, Exchange Defence. It is popular among Spanish coaches across the world, each with their own slight variations. This defence creates numerical superiority around the ball to prevent it progressing to dangerous areas and uses this overload to recuperate the ball quickly. The defence engages the opponents between half and full court, depending on preference. This is why it creates an attacking threat as when the ball is won the opponent is not organised defensively and there is not much distance to reach the goal. I have split this defence into 7 features which are defensive lines, ball pressure, marking & covering, defensive triangle, strong side/weak side, exchange and, finally, defensive rotation. All these are present in the video below and by the end of this post you will be able to identify them all. The exchange defence covers the spaces around the ball with a balance in the position of the defenders. For this reason the defence must have a minimum of three defensive lines and never more than two players in the same line. A defensive line is marked at the height of each defender as this image below demonstrates. The more defensive lines the more security there is as the attack has to overcome each line. It provides cover if a player is beaten, either through dribbling or a movement. The security it provides allows the defence to be more aggressive, maintaining the height of the first line and putting the player in possession under more pressure. Good ball pressure is the most crucial aspect in defence. To clarify, pressure and pressing are distinct concepts (see glossary). Pressure is an individual action related to the distance between the defender and the opponent with the ball. Pressing is the team or collective form of trying to recover possession quickly by closing the distances to the opponents and passing lines. The better pressure on the ball the more space and passing lines are covered, which stops the ball progressing and makes the attack more predictable as they have fewer options. By having good pressure a single defender can protect a large area of the court. In the images below the area shaded in yellow highlights the space that the defender pressuring the ball is covering. In effect, any attackers in this zone have closed passing lines from the ball (can’t receive a pass directly). 1) It starts before the ball is even on its way to the attacker. The orientation of the ball carrier, the pressure on the ball and what passing lines are covered conveys how likely your direct opponent will receive a pass and the risk of the ball being played inside the defence. The more likely and less risky, the less need to cover your teammate and you can move closer to the direct opponent and the passing line (covered in more detail in the next section). 2) As the ball travels toward the attacker, so should the defender. Moving once they have received the ball is too late. This reduces the distance between the defender and the ball which will result in more space being covered as mentioned earlier and forcing the attacker to concentrate on protecting the ball and not what options they have. 3) In the moment before the opponent receives the ball, the defender should slow down to ensure they are not beaten easily with the first touch due to their momentum hindering their reactions. 4) Once the attacker has the ball, the defender should be aggressive by getting as close as possible to maximise the amount of space and passing lines that are covered. Good pressure can be defined as being within touching distance. The ideal distance will depend on the relative characteristics of the two players. An agile defender can get closer and a very skilful or quick attacker must be given more space. 5) From what angle the defender should be pressuring the ball carrier depends principally on considering the attacker’s strongest foot, the area where the concentration of defenders is the highest and avoiding that the ball goes into the heart of the defence. 6) The last point about passing lines that go into the middle of the defence is because any attacker receiving here has the most number of passing options (can go left or right so the defence has more possible space to cover and increased space favours the attack) and, if within shooting distance, has the best angle. So, typically, it is important to cover passing lines into the middle. 7) Avoid attempting to steal the ball if there is a risk that this could mean being beaten or fouling. This is generally an unnecessary risk as good pressure will force the attacking team into a mistake and turning over possession. 9) Good times to intensify the pressure and pressing include when the ball carrier has no passing options, is weak technically, makes a poor control or is facing their own goal. Pressure should be built incrementally with caution and organisation to avoid leaving spaces that opponents can take advantage of. The pressure on the ball is key to the positioning of all the other defenders, including the goalkeeper, due to space and passing lines it covers. Other considerations for their positions include the location of the ball, position of teammates and opponents, characteristics of opponents and teammates, orientation of the attack, orientation of the defence and passing lines. The aim is to work as team to first of all ensure the ball doesn’t progress but, secondarily, to be as aggressive as possible to win the ball back. The objective of the two players in the 1st line of defence is to co-ordinate their movements together to act like a barrier, pressuring the ball and never allowing the ball to go past them. In the first image above the defender on the far side is in the wrong position as there isn’t good ball pressure and is thus allowing an open passing line through the defence into the pivot, a dangerous outcome. He needs to be on the edge of the yellow zone at the same height as the other winger as shown by the red arrow. To win the ball back the defenders need to be as close as possible to their opponents and passing lines whilst still preventing forward passes. In the second image above there is now good pressure on the ball so that same defender can be closer to their direct opponent and the passing line towards them. Their position is ideal in the image as any closer to their own goal and they would be just covering the same space/passing lines as their teammate pressuring the ball and any nearer to their direct opponent and the ball could once again be played into the pivot. The other defenders must always be reading the pressure on the ball and adjusting their positions accordingly between covering more and marking their opponent and the passing lines more. If at any time pressure on the ball is lost or the defence becomes disorganised then all the players should return to the space goal side of the ball. They may need to delay the attack to allow this, either through closing passing lines or dropping off, allowing the defence to recover, re-organise and then the pressing can be restarted. We have looked at the individual pressure and the 1st line and how they try to maintain or increase the height of the defence and get good pressure on the ball. Now we will look at the role of the player in the 2nd line who needs to provide the security to allow them to do this. This player should tuck in behind the 1st line to create a defensive triangle. As mentioned before, the better pressure on the ball the more they can cover and the less they have to be concerned with marking their direct opponent. In this position they need to carry out an action known as floating by controlling the space and being ready to intervene in various potential situations depending on what develops. This includes covering their teammate if they are beaten by a dribble or a possible wall pass or to make an exchange in marking responsibilites. They are reading the situation to anticipate what will happen and adjusting their position, ready to act. We can see with the defensive triangle that this defence tries to create numerical superiority around the ball and to dominate the space nearby. This supports a concept of strong side/weak side. I said earlier that the pressure and pressing should be intensified when the ball is on the wing, giving the attack the only option to play in that direction in order to reduce their options and space. When the ball is by the wing, the whole of the defence should be on this side of the court to outnumber the attack and be in position to intercept the ball. This is known as the strong side. The side away from the ball where the defence has less presence is known as the weak side. The dominance of the defence on the strong side converts into a vulnerability on the weak side as there is more space for the attack. For this reason the defence must try to prevent the ball going to the weak side quickly before they has chance to reorganise and regroup around the ball. In the last image above Spain’s number 4 is preventing the ball switching to the other wing and the weak side being attacked before the defence can reposition. If the ball goes to the other side but backwards that is fine as the attack has gone backwards towards their own goal. Now that the basic structure of the defence has been covered we can look at when and how exchanges of individual marking responsibilities are carried out. The key benefit of making exchanges is to maintain the defensive height and pressure on passing lines. It can also result in less running though this is more a side effect of the defence then an objective (though I have had several teammates who try to make exchanges with only this consideration in mind!). The key to exchanges is the pressure on the ball and the opposite winger tucking in to create the defensive triangle. There are generally two situations where exchanges of individual marking responsibilities for attackers without the ball can be made. The first, if there isn’t good pressure on the ball, is the defender in the 1st line must only exchange if they can see both the attackers in their visual field. They should follow their direct opponent by moving backwards without turning their body (so they can maintain their visual field) for the first few meters. If they don’t see another attacker to exchange with then no exchange takes place and the follow the same opponent. The 2nd situation where exchanges are made requires there to be good pressure on the ball. Then an automatic exchange can be made and the defender can stay on the passing line even with their opponent out of their visual field or goal side of them. This can only be done if the pressure means the ball can’t be played on their back, behind the 1st line, risking a 3v2 situation in favour of the attacking team. If the 1st line gain possession then a 2v1 counter attack will be generated. Even with these guidlines there can be misunderstandings or different interpretations. For this reason when making exchanges communication, visual and verbal, is important as well as trust in the defensive organisation. Even the best defence will be overcome sometimes. It could be an error or just good play from the attack. If a player is beaten, there is a mistake in exchanging or the ball gets played to the weak side quickly then the defence needs to reorganise. This can involve a rotation of just two players switching roles or up to all four outfield players rotating positions. An example of a 3 player rotation could involve all the players that form the defensive triangle. In the image below if the defender is beaten down the line, Spain’s number 14 can go to close the ball carrier, player 4 takes 14’s position in the second line and the beaten defender takes 4’s position in the first line of defence. Now the defence is reorganised with everyone back in position. That same situation could also cause a rotation of all four outfield players. In that image we can’t see the position of the last defender. We could imagine that he is on the same side, marking the pivot. If this is the case then it might be him who takes the dribbler and number 14 takes the sweeper’s responsibility of marking the pivot. In that case 4 will still take 14’s role in the second line and the beaten player will still take 4’s position in the first line. What determines how the defence rotates is dependent on the distances. We always want the players to reorganise as quickly as possible so whichever involves the least distance to run is the optimal solution. Reading the game, communication and co-ordination by all the players is key. This defence doesn’t allow the opponent to have the intiative or be comfortable in possession. As well as preventing goals being conceded, it is an attacking weapon as you can see in many of the videos. The risk to this defence is an attack that has width and depth, combined with quick ball and player movement. Through this they can stretch the defence, attack the spaces that have been left and increase the difficulty of reading and reacting to situations. Another threat is the 1st line of the defence being broken through attackers showing between the lines and creating a possible 3v2 attack. Which system is best for a team is dependent on many factors but the individual defence with exchanges is based on co-operation and, if executed well, will always give better results than a system that is deficient in this characteristic. To execute well it needs the co-ordination and understanding that can only be obtained through training. I recommend this system is introduced to players the same way I structured my explanation. First, working on the individual defending aspects (ball pressure) then introducing a second player and how they co-operate (marking/covering). After, add the third player (principally defensive triangle/exchanges but also the other features) and finally work with a complete team. This way the complexity increases incrementally. A key point to make is, as mentioned at the start, these are principles, concepts and guidelines. They are NOT rules that must be followed in every situation. This applies to all tactical information in futsal. 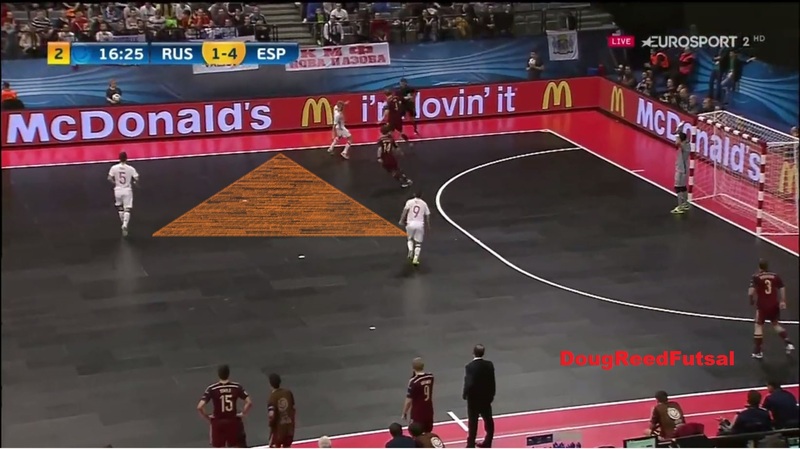 The possible game situations are effectively infinite and in the history of futsal there has never been an exact situation repeated. The players on the court are in the best position to understand what is occurring and must be allowed autonomy to use their initiative and take decisions. Corrections can be made afterwards. A benefit of improving a team’s defence is it can subsequently enhance their attacking play without coaching. For example, if the ball carrier and passing lines are placed under more pressure then the attackers will have to think and circulate the ball quicker. I advise against using this defence with players under 16 years old as an individual defence will teach them the basic fundamentals of defending they need to acquire first and that underlie any defensive system. Training time with youth players can be allocated to areas more important for their individual development. As with any system, defensive or attacking, it needs players who have compatible characteristics. For this defence, the most important are awareness, reading of the game and decision making. Further, players who have the physical characteristics to be able to press intensively. This defence can allow a player with those characteristics to have the same impact as a skilled 1v1 player by creating goal scoring opportunities. An example from Spain is Pola who was my player of the tourament for Euro 2016 even though Miguelin won the Golden Shoe and shared the Golden Boot award with teammate Rivillos. His defensive performance throughout the competition, which led to 2 goals in the final, contributed as much as anyone to their victory. That concludes my overview of Spain’s defensive system and how it functions. If you go back to watch that first video (or any of the videos), you can see how all seven features of this defence I covered are applied. The aim of this blog is to create discussion and share knowledge about futsal, something I feel is important for the development of the game. If you enjoy any of my articles, please share them. Almost 5 years I’am trying to find something like this. Everything in one place! Thanks a lot mate!! Absolutely great! Great article Doug. Thank you AND keep doing well!